This year (1989) marks the 60th anniversary of possibly the most significant faculty recruitment campaign in the history of the Department. It was in 1929 that R. B. Moore, Dean of what was then called the Science School, convinced an internationally renowned physicist and scholar named Karl Lark-Horovitz to bring his talents to Purdue on a permanent basis. The rest, as they say, is history. In the next 29 years, Lark-Horovitz transformed Purdue's Physics Department from a woefully underfunded, understaffed and underappreciated scholastic entity into a modern center for scientific study. By the time of his death in 1958, Lark-Horovitz had helped establish the Purdue Physics Department as a leader in innovative research and in undergraduate and graduate physics education. He was a man known for his forward thinking, his astounding knowledge of art and music, and also for the heavy-handed manner in which he ran his department. He inspired many, confounded others, but always kept as his goal the continued movement of his department toward the horizons of knowledge. Born Karl Horovitz in Vienna, Austria, on July 20, 1892, he was exposed to the wonders of science and the beauty of art and culture at an early age. His father, Moritz, was a noted dermatologist, who along with Karl's mother, Adele, encouraged the young man's varied scholarly interests in fields as diverse as botany and the classical works of the Roman poet Horace. And when it came time to choose between enrolling in the engineering or the humanities branch of Austrian secondary education, young Horovitz, perhaps with a little parental nudging, chose the Humanistic School. Upon graduation, he entered the University of Vienna in 1911. His education was interrupted by World War I, during which Horovitz served with the Austrian Signal Corps. After a serious injury and a long recovery, he finished his undergraduate studies with a degree in chemistry. His interests, perhaps sparked by his exposure to radio science in the war, leaned toward physics and with further study, Horovitz received his Ph.D. in that field in 1919. In those days, many institutions allowed a student to gain a post-graduate degree outside of his field without a course of formal study as long as the student could pass what amounted to a doctoral equivalency exam. Due to his somewhat ambivalent educational focus, Horovitz's early work as a scientist frequently focused on the interface between physics and chemistry. However, this didn't keep the esteemed Rockefeller Institute Board from awarding Horovitz an international research fellowship in 1925, only the second ever given at that time. The following year brought another landmark of sortsKarl Horovitz adopted his wife Betty's surname of Lark, linking his wife's name as an artist and print-maker to his own. Clearly the young scientist, with a world of achievement in front of him, still appreciated the value of intellectual balance. It would serve him well in his stateside endeavors. The Rockefeller award enabled Lark-Horovitz to travel to North America, where he conducted research in Toronto, at the University of Chicago, the Rockefeller Institute and Stanford University. In 1928, Purdue's Dean Moore invited the young upstart to give some guest lectures at Purdue, and was so impressed with Lark-Horovitz's abilities that he offered the young Austrian a position the following year. It can only be speculated upon as to why such a rising star would choose a relative backwater like West Lafayette, Indiana for his home. Certainly Purdue could not match the prestige and amenities of the greater institutions of that day. But perhaps a big fish/small pond situation attracted Lark-Horovitz. Here was a place where he could make a real difference, and here was a man faced with a challenge that for him was likely difficult to refusea challenge to make something out of nothing. "The Physics Departmentat the time of my arrival, existed mainly as a service department for the different schools. The training of the professional staff and the assistants had been only routine teaching, and with one exception, nobody was doing any research work or was interested in such work. The equipment was only suited for the different courses in undergraduate physics." All of that was soon to change. In 1929, Lark-Horovitz was named Head of the Department and he wasted no time getting to work. He organized and expanded a physics research library. He set up an instrument shop to construct the necessary research equipment which couldn't be purchased with a small budget. And above all, he began to network. Contacts were made, friendships were won, administrative minds were changed and coffers were opened. Before long, the staff list of Ph.D.'s and graduate assistants was growing, along with both public and private monetary sources. Over it all, Lark-Horovitz, or "Doc", as his minions and colleagues were beginning to call him, presided. Some would have said "dictated." He decided which research projects would be pursued and what curriculum would be followed. Of chief interest was the pursuit of currently relevant, cutting-edge research, along with providing an environment in which bright young physicists could thrive. Lark-Horovitz placed greater importance on the study of nuclear physics in the early days of its genesis as a viable discipline. 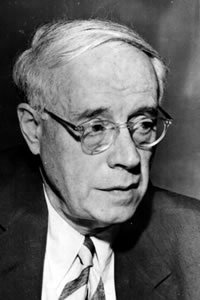 He also nurtured future Nobel Prize winners Edward Mills Purcell and Julian Schwinger: Purcell in his undergrad years and Schwinger during his tenure as an associate professor and researcher. Of further note was Lark-Horovitz's innovative adoption of a guest lecture series, which drew such physics luminaries as Wolfgang Pauli, J. R. Oppenheimer, Emilio Segrè, R. H. Fowler and Marcel Schein. Through hell or high water, Doc was going to pull the Department into the twentieth century. Though his administrative duties kept him busy, Lark-Horovitz the physicist turned his eye to a then new area of theory and research in the 1940ssolid state physics. And it was there that he and Purdue would make their greatest impact in the world of physics. Through his own work and that of many others, including the U. S. Army Signal Corps (recall his early days in the war), the field of semiconductor research was expanded greatly. Lark-Horovitz became one of the world's leading authorities on semiconductor theory, and was the first to recognize the benefits of using germanium as the material with which to work. Purdue researchers made the discovery of high-back-voltage rectifiers that opened up the possibility of using crystal rectifiers as second detectors in radar, and played an important role in the development of that wartime device. Additionally, observations of the changing resistance of a semiconductor under an applied voltage helped point the way to the discovery of the transistor. Of equal importance was the research done on materials preparation, as well as the investigation of fundamental properties of semiconductors. Much of this research was considered to be off the beaten path of then current scientific pursuits, but it reflected Lark-Horovitz's extraordinary vision, and the extent to which he could and did control physics research at Purdue. Needless to say, it all paid off in a profound manner. Through it all, Lark-Horovitz never let go of his basic tenet for the scientific discipline, that science, and a love and fascination for it, should be nurtured by everyone. His efforts to improve the accessibility of science for high school students and university non-science majors brought him a Distinguished Service Citation from the A.A.P.T. in 1935. To Doc, science was the study of nature in its most pure and beautiful form, ever open for the inquisitive mind to attempt to understand, and for the poetic mind to marvel at. He believed that there was no reason why both spheres of intellect couldn't thrive within the same realm. As Lark-Horovitz's biographer V.A.Johnson put it, "He was a devoted student of the interaction, throughout the course of human progress, of physical science and natural philosophy with politics, literature, the arts, and the development of social institutions." Karl Lark-Horovitz molded Purdue Physics, led it, at a time when the Department needed it. His methods, his style, his temperament, were probably at odds with today's norms. Gone are the days of his authoritarian control of the Department, as well as the quaint string recitals at his home for the staff on Sunday afternoons. His methods might not work today, but, for then, he was the right man at the right time.